Isn’t It Really Time, at Long Last, for Us to Approve ERA - Moore County Democratic Party - Be Part of the Process! This article appeared in The Pilot on Sunday, November 19th, and the author, Paul Dunn, is a long time member of the Moore County Democratic Party. In a recent survey, 94 percent of Americans reported that they would gladly support an amendment to the U.S. Constitution that would guarantee equal rights for men and women. Ironically, 80 percent of those polled thought that the Equal Rights Amendment had been ratified by the states years ago. It wasn’t. North Carolina, once admired as the most progressive of all Southern states, has not yet ratified the Equal Rights Amendment (ERA). Whether it will now do so under an incredibly regressive Republican legislature is a big question mark. To date, it has not gotten fair hearings in committee. For the ERA to become law, only two more states must ratify it. Were North Carolina to do so, its former progressive reputation would go a long way toward restoration. On March 22, Nevada became the 36th state to ratify the ERA. This year, ERA bills have been introduced in the legislatures of Arizona, Florida, Illinois, Utah, Virginia, and our own state of North Carolina. The Declaration of Independence reads that “All men are created equal.” The writers meant that literally. What Jefferson penned was based upon then-accepted ancient English common law. 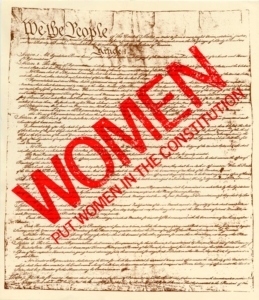 In 1787, when the U.S. Constitution became law, it did not recognize women as citizens, or as individuals with legal rights. A married woman’s person and property were owned by her husband. Slaves had no rights. You may be surprised to learn that the ERA passed both houses of the U.S. Congress 45 years ago. In 1972, there was no Flat Earth Tea Party, and believe it or not, the GOP included liberal legislators. But by the initial deadline, only 35 of the required 38 states had ratified the amendment. The amendment would probably have breezed through most state legislatures, had it not been for persistent pressure against it, beginning in 1970, by conservative activist (and Pat Robertson’s favorite lady) Phyllis Schlafly. But just as her anachronistic opinions are minority viewpoints in 2017, they still hold powerful sway among many ultra-conservatives and religious fundamentalists. Many religious leaders still preach to their flocks that a woman’s place is in the home, and that she is to be subservient to her husband. Cruel attacks on Planned Parenthood are all hallmarks of the political tableau of the far-right enemies of ERA. Many who strongly favor the ERA point to glaring issues of historic pay inequality, persistent legislative action assuring pregnancy discrimination, and violence against women, often by husbands. Between 1972 and 1982, the N.C. General Assembly deliberated ratification unsuccessfully six times. Now there is a concerted effort by determined women’s groups, and by men who support the idea of liberty for all, to finally ratify the amendment. This renewed movement is prompted by extremely hostile political activities taken to demean the status of women and take away their freedoms. The GOP’s first president believed in equal rights for women. In 1940 the GOP included ERA language in it party platform. It removed it in 1980. You may wish to ask State Reps. Jamie Boles Jr. and Allen McNeill and Sen. Jerry Tillman where they stand on the ERA. Paul R. Dunn lives in Pinehurst. Contact him at Paulandbj@nc.rr.com.